Last night marked the end of a Semi-Super Season for the New England Partiots. 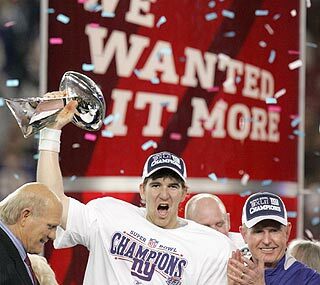 The New York Giants pulled off one of the biggest upsets in Super Bowl history. While it may not have been the largest upset from the sheer perspective of the point-spread, in the hearts and minds of many fans and viewers it far exceeded any of the past shocking upsets. The Pats ran off 18 in a row, mowing over everything in their way. Then a funny thing happened…they started to become human. Brady got pressured, the defense started to look its age, and a team without any pressure on its shoulders whatsoever caught up to them. Here is an awesome tribute to the Pat’s Season. The game itself was one of the most exciting Super Bowls in recent memory, where the play on the field actually managed to overshadow the commercials for once. The G-Men deserve all the credit in the world for beating a seemingly unbeatable team. You can insert your cheesy overran football cliche here (“that’s why they play the game”, “on any given Sunday”…etc. 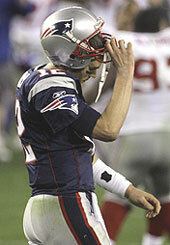 ), but regardless of how it seems on paper, the Pats managed one of the biggest letdowns in sports history. While these Pats were hell-bent on joining the Miami Dolphins’ 1972 undefeated team, they instead made their own mark on history by running off a perfect 16-0 regular season and 2 more playoff wins only to wind up 18-1 with that ‘Giant’ loss in last night’s SB. This certainly puts an exclamation point on the end of the 2007-2008 football season, and while The Movie Mind will begin his “football withdrawal”, it also means that more time will be dedicated to watching those films that end up wasting my time so you don’t have to waste yours! The other thing the end of the football season marks is the beginning of baseball season! So with February 14th approching rapidly, (and I’m not talking about Valentine’s Day guys – come on!!) which is when pitchers and catchers report to spring training, there is no better way to ring in the new season than with The Movie Mind’s All-Star Movie Baseball Team! Check back because it is coming this week! Great Superbowl. Best one I can remember. What a fitting way for the classless Belichick to end his season…running off the field with time left on the clock. Other than beating the Red Sox in Game 7 in 2003, this was the greatest moment in NY sports history in the last 10 years. The Movie Mind is a Chiefs fan and a phony Giants fan who had NO faith going into Green Bay, let alone Phoenix! This IS why they play the game….so Brady’s Hollywood a** can get knocked to the ground multiple times. Sooooo sweet! !